Add one more entry into the program record books for Oregon’s Sabrina Ionescu after the junior guard dished out 17 assists in the Ducks’ 110-48 shellacking of Long Beach State Sunday afternoon at Matthew Knight Arena. All eight available players logged in excess of 15 minutes of court time and six posted double figures, led by forward Erin Boley’s 24 points combining a nice mix of treys and shots on cuts into the paint. Ruthy Hebard grabbed a game high 14 rebounds and scored 19 points, hitting eight of her eleven attempts from the floor. With Satou Sabally and Maite Cazorla adding 18 points apiece and the team as a whole shooting at a 60.9% clip for the night Ionescu was quite content to feed the ball to the open player. Defensively the Ducks held Long Beach State to 34.5% shooting from the floor on 20-58 (4-29 3pt.) and forced 18 turnovers, turning them into 23 points. 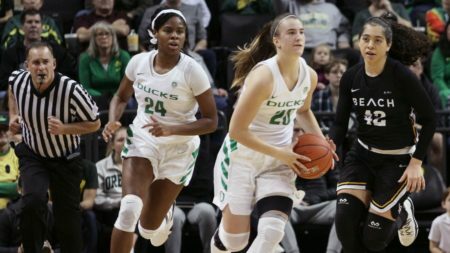 On both ends of the court, Oregon owned the paint, out scoring Long Beach State 50-20 inside and more than doubling them up in rebounds, 41-20. Finals week has the Ducks off the court until December 9th when they will play Michigan State in East Lansing. Tip off is set for noon and will be televised by ESPN2. After facing South Dakota State in Brookings, SD on Wednesday (5:00 pm ESPN3), the Ducks return to host Mississippi State at 7:00 pm on Tuesday, December 18th in what will be the first match up between top-10 teams at Matthew Knight Arena.